Barbara Broyles always told her daughter Betsy that it was important to do a good deed, but if someone found out it didn’t count. Well, this time it counts anyway. Betsy Broyles Arnold moved from Texas to Fayetteville to take care of her mother after she was diagnosed with Alzheimer’s disease in 1999. Her mother, the wife of famed Arkansas football coach and athletic director Frank Broyles, died from complications of the disease in 2004 at age 79. In 2006, the Frank & Barbara Broyles Legacy Foundation was created to help support and educate caregivers of Alzheimer’s patients. 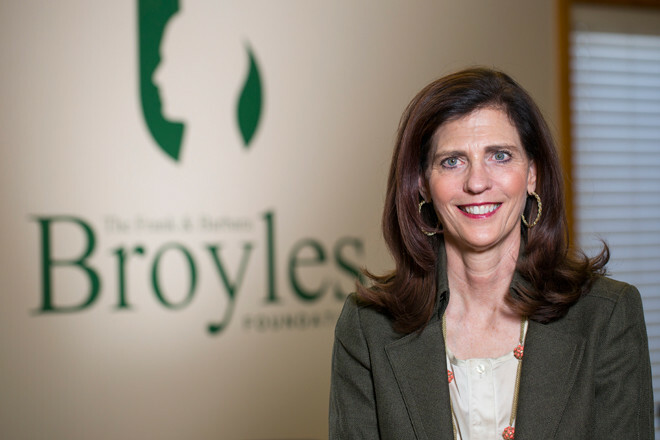 Betsy Arnold is the foundation’s CEO and co-author of the “Coach Broyles’ Playbook for Alzheimer’s Caregivers,” of which the foundation has distributed more than 1 million copies in 11 languages. The foundation does more than distribute books. Arnold travels frequently to educate caregivers and health care workers on the ever-changing facets of Alzheimer’s and other forms of dementia. Arnold said the foundation’s goal is to be a “one-stop shop” for resources such as education, counseling, support groups and advocacy. The foundation has recently begun charging a nominal fee for the book, but all other services are available at no charge to caregivers. Arnold said the foundation sticks with caregivers throughout the entire “season,” as Arnold calls the time of the disease. Arnold clears her schedule at a moment’s notice to help caregivers in need.